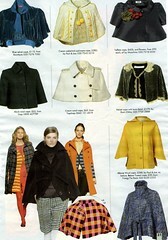 I fancy finding a cape pattern this week and making a tweedy one for winter. There was a story on the Harris tweed weavers on Countryfile today. The wooden looms were so burnished from many years of use and it was fascinating to watch. They nearly went out of business in the 80’s and 90’s and it wasn’t until Nike put in an order for 250 yards for some shoe samples that things improved. It would be a tragedy if skills like these were lost. I like the style of the checked one at the bottom of the shot (from today’s Sunday Times Style mag) – simple lines and looks quick and easy. Am going to town on Tuesday, so will have a look in Liberty for a pattern. Have had an inside weekend because I’ve got a cold……..general grumpiness aside, I’ve managed to finish the back of Mist and start the left front. Not too bad for week 5, I suppose. 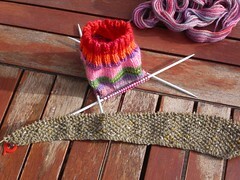 You can see the wrap-stitch shaping in the shot below with a new sock I started yesterday. I’ve got lots of this yarn from 21st century yarns and originally bought it to make baby stuff for gifts, which I have been doing but there’s lots of it left. Hence the emerging sock. It will be a bit of a ‘make it up as I go along’ thing. 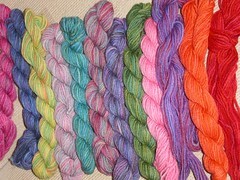 No plan other than to include many colours, mainly because I think each skein is only about 15g.